In an early scene from American Sniper, a young Chris Kyle receives some wisdom from his strict father: in this world, there are three kinds of people--wolves, sheep, and sheepdogs. He makes it very clear that there is no room for wolves or sheep in the Kyle family. Instead of humility or power, the primary value for the Kyles is one of protection. You defend your own. It's a value Chris will carry into adulthood as a Navy SEAL sniper in the Iraq war, defending his fellow military brethren through the estimated 160+ kills he inflicts upon the enemy. 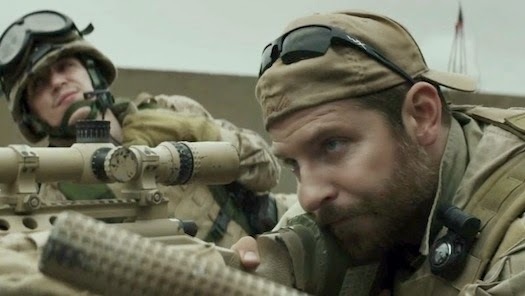 American Sniper portrays Chris Kyle (Bradley Cooper) as a real-life version of G.I. Joe, "a real American hero." This heroism is due to his excellent sniper skills and seeming invincibility, earning him the title of "Legend" among the troops and a sort of celebrity status both with his peers and the Iraqi enemy. It's certainly a remarkable skill, as Chris is able to make difficult life-and-death decisions with a collected composure, breathing slowly and pulling the trigger with confidence. His first kills are a mother and son about to toss a grenade at a convoy, but this doesn't seem to bother him much. There are no scenes of haunted dreams or of emotional turmoil; Chris tucks any pain inside himself, only revealing it in a few brief (though cathartic) moments where tears well up in his eyes. He's a real cowboy, an American hero. And real cowboys don't cry. An Americanized Christianity is evident in American Sniper, particularly through Chris's good luck charm--a pew Bible he took from a church in his boyhood, which he keeps tucked beneath his body armor. This type of Christianity is a moralistic therapeutic deism, a God intended to make us feel good when we really need Him, but is mostly absent and unnecessary for our daily tasks. 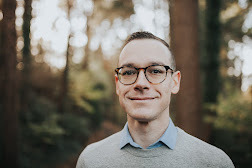 A fellow SEAL, Marc Lee, is a man of faith and a former seminary student who serves as an embodied conscience for Chris. Marc asks Chris about his Bible, if he ever opens it. He doesn't. Marc is clearly troubled about the direction of the Iraq war, wondering about its purpose and his involvement. Chris essentially shuts him down, asking "you're not going to get all soft on me, are you?" Marc wonders about Chris's obsession with his task, asking Chris if he may have a savior complex. But when Marc is killed in an ambush, his mother reads aloud a letter at his funeral sharing his doubts about the American military and the Iraqi conflict. Driving away from the funeral, Chris is unflinching. "That letter killed him," he tells Taya brusquely. Then, a tense silence. To ask questions about life and death, faith and God, morality and sin--those are irrelevant to the task at hand, which is to defend America and kill the enemy. For Chris, protecting his own is the prime objective, and it's the excuse he gives Taya when he's physically absent in Iraq and emotionally absent back home. He's protecting her, and that's that. When the mission is over, then he'll come home. So it's interesting in a final battle where Chris is escaping from incoming Iraqi troops, the three objects left behind in the dust are his helmet, his sniper rifle, and his Bible. What's to make of this image? Perhaps for Chris--and for many Americans--these objects are intertwined, vital weapons in the war before us which are deemed unnecessary when there isn't a conflict in need of our defense. I don't want to critique American Sniper based on political leanings. To some degree, liberalism or conservatism don't matter. A well-made film deserves its awards and merits, and a poorly crafted film earns its appraisal. This is a mediocre war movie with strange editing choices, abrupt and jarring pacing, and a good-but-not-great performance from Bradley Cooper in the titular role. Secondary characters aren't given much to work with--Sienna Miller as Taya spends most of her scenes crying and complaining while Chris silently stares. When contemporary war films like Fury, The Hurt Locker, and Letters from Iwo Jima (a superior Clint Eastwood-directed war film) offer gut-wrenching portrayals of military life, brilliant performances and aesthetics, and manage to ask thoughtful spiritual questions about the nature of human depravity, I can't help but wonder why American Sniper is being so highly lauded, despite its flaws. Maybe we're unsure about who the real American heroes are these days. In a world filled with wolves and sheep, maybe we need a few more sheepdogs.